this is your spiritual act of worship.” Romans 12:1 NIV. Life is a precious, priceless gift. Never regard life as expendable, insignificant, or to be cheaply given. Yet Jesus issued a crucial call to discipleship. “If anyone would come after Me, he must deny himself and take up his cross daily and follow Me.” Luke 9:23 NIV. In 1956, Jim Elliot, a 28-year-old missionary pilot, was one of five missionaries martyred by Huaorani Indians in Ecuador. In his personal journal, he had written, “He is no fool who gives up what he cannot keep to gain what he cannot lose.” How very true! Jesus issued a monumental challenge that still resonates within the heart that He created, “Whoever wants to save his life will lose it, but whoever loses his life for Me will save it.” Luke 9:24 NIV. Jesus does not depreciate your life as unimportant or without supreme value. But what did Jesus mean when He required that you, “lose your life”? Would it mean to trade a few years here for an eternity with God? Could it mean to live for something and Someone much greater than yourself? Yes, that must be it, sacrificing something you treasure for something that you would treasure even more, as well as forever. Jesus was unapologetic when He said, “And everyone who has left houses or brothers or sisters or father or mother or children or fields for My sake will receive a hundred times as much and will inherit eternal life.” Matthew 19:29-30 NIV. Squandering your life is a terrible waste, while sacrificing your life for God is a noble gift. Heed Jesus’ warning, “For whoever wants to save his life will lose it, but whoever loses his life for Me will save it. What good is it for a man to gain the whole world, and yet lose or forfeit his very self?” Luke 9:24-25 NIV. The Great Exchange is when you joyfully surrender what was formerly most precious to you to receive what you never imagined could be yours. Today, I pray for you to surrender your life as a worthy gift given back to God. Good Friday is a day unlike any other before or since. On this day, Jesus of Nazareth, the Son of God and Sovereign of Heaven’s Kingdom, died for the sins of all the world. On His head was a crown, but not one you would suppose the Son of God should have worn. He wore a crown of cruel thorns, not a gold, bejeweled crown a Sovereign would wear. Heaven’s royalty was subjected to earth’s worst cruelty. Those thorns were twisted together by the hands of mocking soldiers who saw nothing more than a common criminal who would die for his crimes. To them He was no more than another day’s work in a troublesome province of Rome’s conquest. Some years ago, while in England with my friend, Andrew took me to tour the Tower of London where the spectacular, British Crown Jewels are kept. The priceless Crown Jewels are displayed in a collection of such incomparable beauty and incalculable value, being worn only by the monarchs and royal families of Great Britain across centuries. In cruel contrast, the crown Jesus wore was common not priceless, of pain not beauty, imposed with rejection and ridicule not recognition or honor. Anyone familiar with this part of Texas knows about mesquite thorns, an inch or more long, hard as a nail, and sharp as a needle. They can puncture a tire or shoe, and never break. The thorns of Palestine were much like that. And that cruel crown was painfully forced deep into Jesus’ scalp where the nerves and blood vessels are closest to the skin, resulting in immediate and immense pain and profuse bleeding. It was our sins not His that pressed them into His brow. From where did those thorns come? Thorns came from the original sin in the Garden of Eden. To Adam and Eve, God said, “The ground is cursed for your sake . . thorns it shall bring forth for you.” Genesis 3:17-18. 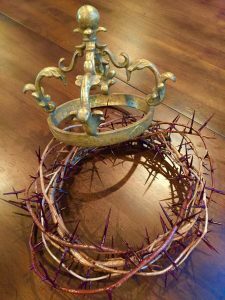 Appropriately, His crown of thorns represented the consequence of your sins and mine. Isaiah wrote, “But He was wounded for our transgressions, He was bruised for our iniquities; the chastisement for our peace was upon Him . . and the Lord has laid on Him the iniquity of us all.” Read Isaiah 53:3-6 NKJV. But Jesus wore that crown of shame and pain that would have been yours, and mine. In the great exchange of redemption, Jesus wore your crown that spoke of sin and judgment, to give you His crown, “the crown of righteousness, which the Lord, the righteous Judge, will give to me on that Day, and not to me only but also to all who have loved His appearing.” 2 Timothy 4:8 NKJV. But Easter – His resurrection – promises a greater day will yet dawn when God shall have “crowned (our Lord) with glory and honor.” Psalm 8:5 NIV. His crown of thorns that spoke of our sin has been exchanged for a crown of glory that testifies of our salvation. “We see Jesus . . now crowned with glory and honor because He suffered death, so that by the grace of God He might taste death for everyone.” Hebrews 2:9 NIV. Read Psalm 21:3-6 NLT. No wonder we call this Friday good! Today, I pray for you to reflect on the awful, awesome price Jesus paid for your salvation. 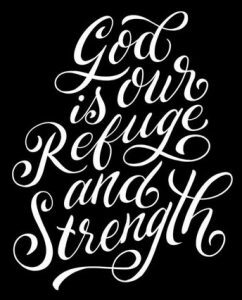 “God is our refuge and strength, an ever-present help in trouble.” Psalm 46:1 NIV. John marveled at the mystery of incarnation, “He was in the world, and though the world was made through Him, the world did not recognize Him. He came to that which was His own, but His own did not receive Him.” John 1:10-11 NIV. In similar ways, God is daily in our lives, yet we can fail to recognize and receive Him. Live in expectation of His company. This I have learned about my God. He chooses to come at unforeseen moments, to improbable places, and in unthinkable ways. Without announcement, God comes while we are busy in common, everyday routines. Fleeing from his father and brother because of his own guile and deceit, Jacob found himself alone, and yet not alone because God was there. After an uncertain, restless night, Jacob awakened. Only then did Jacob finally realize that God had visited him in the night, providing direction for his journey and speaking promises to his heart. More in surprise than expectation, Jacob recognized, “Surely, the Lord is in this place, and I was not aware of it.” Genesis 28:16 NIV. God is there when you are unaware or least anticipate He is near. Much later, David would affirm, “God is our refuge and strength, an ever-present help in trouble.” Psalm 46:1 NIV. By observation, I have become convinced that God is most near when I least anticipate, even the times when I have most needed but often felt the least like asking. As with Jacob, the Lord is not with you because you have everything in order, nor just when you recognize you most need Him to be. God seeks your fellowship, continually desiring to be with you, near you. Yet the patience of God waits for you to recognize and welcome His presence. His love draws Him to you; His commitment keeps Him close beside you. God’s Word promises, “Surely, I am with you always, to the very end of the age . . God has said, never will I leave you, never will I forsake you.” Matthew 28:20 NIV/Hebrews 13:5 NIV. Currently. Constantly. God is with you always. Years earlier, I read this quote, “There’s no event so commonplace but that God is present . . leaving room to recognize Him, or not.” Frederick Buechner, American author and theologian. Usually, the problem is that you do not know when or how God will appear, or through whom He will speak. He may speak through a wondrous act of power; a friend’s simple words of caution, counsel, or encouragement; or life-saving counsel in a distressing situation. Your goal should be to keep your eyes upon the Lord, with your ears tuned to His voice. In unlikely times, give God your undivided attention. “You will seek Me and find Me when you search for Me with all your heart.” Jeremiah 29:13 NKJV. Adam found God in his disobedience. Job found God in his tribulation. Jonah found God in his disobedience. Elijah found God in his despair. Daniel found God in a lions’ den. David found God in his repentance. Peter found God in his denial. 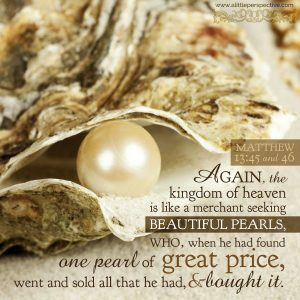 Paul found God in a shipwreck. John found God while in exile on Patmos. “God did this so that men would seek Him and perhaps reach out for Him and find Him, though He is not far from each one of us. ‘For in Him we live and move and have our being.” Acts 17:27-28 NIV. Today, I pray for you to watch for God in ordinary times and extraordinary ways.